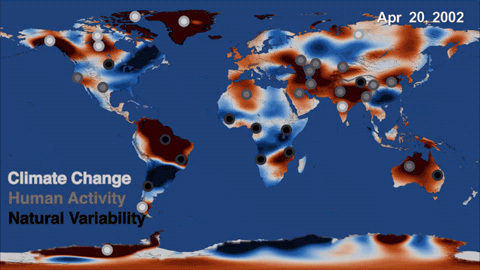 Between 2002 and 2016, NASA's Gravity Recovery and Climate Experiment (GRACE) tracked the movement of freshwater around the planet. The twin GRACE satellites, launched in 2002 as a joint mission with the German Aerospace Center (DLR), precisely measured the distance between the two spacecrafts to detect changes in Earth's gravity field caused by movements of mass on the planet below. Using this method, GRACE tracked monthly variations in terrestrial water storage until its science mission ended in October 2017. Rodell and his colleagues pieced together multiple factors to explain the loss of 5.5 gigatons of terrestrial water storage per year in Xinjiang province. Less rainfall was not the culprit. Additions to surface water were also occurring from climate change-induced glacier melt, and the pumping of groundwater out of coal mines. But these additions were more than offset by depletions caused by an increase in water consumption by irrigated cropland and evaporation of river water from the desert floor. Published on the Horizon International Solutions Site 22 May 2018. The 2nd Edition, Water and Sanitation-Related Diseases and the Changing Environment: Challenges, Interventions, and Preventive Measures, with "Changing" in the title, is with the publisher, Wiley and due to be released within months of this date, 22 May 2018.